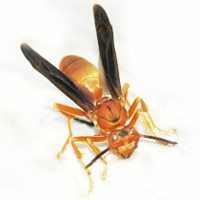 The adults are rather large, between a 1/2 – 1 inch in length. They are robust in size and resemble a bumblebee. 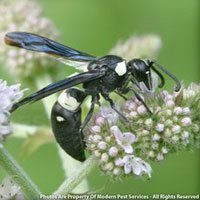 The difference between the two lies in the coloring of the abdomen – the carpenter bee’s is shiny and black, while the bumblebee has a hairy abdomen with yellow markings. 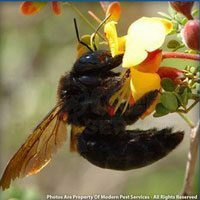 The male carpenter bee can be distinguished from the female by a bright yellow spot on his head. 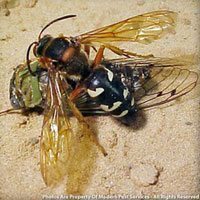 Carpenter bees do not live in colonies as they are not social insects. 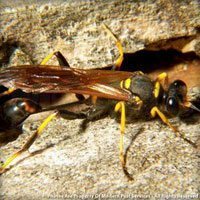 Females will nest in a wide variety of woods, but their preferred wood is weathered and unpainted. 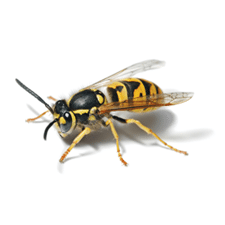 The male is normally aggressive and will buzz around humans, but since the male has no stinger, it is all for show! 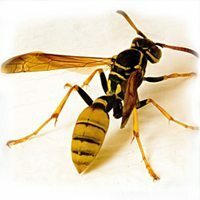 The female has a stinger but rarely uses it. Their main diet consists of nectar. After overwintering, adults emerge in the spring to mate. The females bore holes into wood to create tunnels to lay their eggs and raise their young. Each year they will either create new tunnels or expand on an old one. After the tunnels are prepared, the female lays an egg on a mass of pollen mixed with nectar. She will produce 6 – 8 eggs. The development from egg to adult takes about 36 days.